Bruce and Ann originally wanted a box made out of Swiss pear wood, but as I was looking around the shop for wood, I found one board of camphor wood that was exquisite. I called them and described the wood and they decided to follow my instinct for their project. 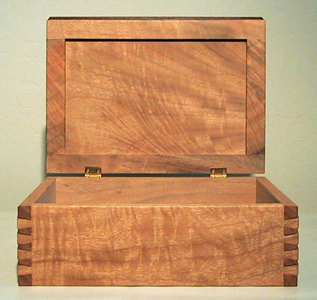 The box is constructed of dovetails that are slightly proud to emphasize the construction and give a tactile affect. The panel for the lid and the box bottom were cut on the band saw, then slightly smoothed out with sand paper. This gives a machined rough texture, but still allows the figure of the wood to show through where the machine marks are sanded smooth. A thin strip of grenadillo wood is used for the handle. Camphor wood has a lovely aroma which can be enjoyed each time the box lid is opened.